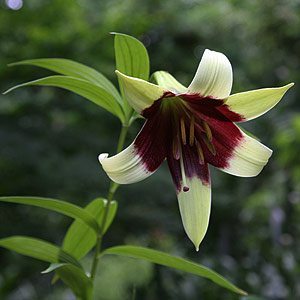 An interesting lily from Nepal however many gardeners find Lilium nepalense is a little difficult, and this is because it has a tendency to ‘wander’. Plant it in one position and it will come up 1m away, it is stoloniferous. We have been growing these for nearly 10 years now and cultivation is not really that hard if you have the right conditions. This is a bulb that prefers a cool climate and although it is regarded as a woodland plant by many, this is the big mistake, to much shade. In deep shade Lilium nepalense will probably not flower well if at all. In wet soil over winter the bulbs will rot and frosts will just knock it over. Is it worth the effort, well we think so, the nodding flowers are very attractive, and anyway, who said gardening was meant to be easy. Position – Full sun to part shade except in hot areas where the afternoon sun will be a problem. However for those of us who do not have these conditions try a large container, deep and large. We have read that you can’t grow them it pots, well we have been doing it for a few years now, and you can, not ideal, but it does work. Put a few supports before you plant the bulb, as it seems that these lilies also like to ‘fall over’ when grown in containers. Plant about 20 cm deep and remember to keep well drained, especially in winter. We fertilize ours with seaweed fertilizer and worm castings / worm tea, and we repot every 3 years. In the garden, we let them do their own thing.